I had many excellent choices for my Andalusian maindish. Rabbit with Blackberries and Brown Sugar, Rabbit in Almond and Olive Sauce and Lamb stew with apples all sounded wonderful. However, I finally decided to make oxtail stew mostly because Mike loves it. I have been making a (much simpler) Basque version of this dish for a number of years to great success, so trying another version was tempting. I found several recipes for Andalusian oxtail stew. Most come from Ronda, an ancient city well known for bullfighting. I don't know if originally oxtail stew was made with real bull or ox tails, however the ones you find at the supermarket now come from cows. Try to get the oxtails already cut (rather than one large oxtail), and choose packages with large pieces - as these are meatier. 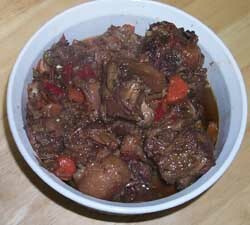 The recipe below is a combination of several oxtail recipes I found. It calls for several strands of saffron - but you can leave them out. I think that the other flavors in the recipe are too strong to let the saffron contribute much. It was very good, extremely hearty and savory and we very much enjoyed it. Bear in mind, however, that oxtail stew is extremely rich and fatty. One of the things that makes the stew so good, is that the fat from the meat slowly melts away during cooking and gets combined with the other ingredients, making a very rich and savory sauce. This is certainly not a dish for anyone who is watching their fat intake, though if you'd like you can refrigerate it after making it, manually take out the congealed fat, and then re-heat it. Though it does not seem to be traditional in Andalusia, you may want to serve this dish with some rice. The rice tastes great with the sauce, and helps counterbalance the richness of the stew. 2 green bell peppers, seeded and chopped. 2 cups amontillado sherry or dry white wine. Heat the olive oil in a large sauce pan. Lightly salt oxtails and brown on each side. Take oxtails off the oil and set aside. Brown the onion and garlic in the remaining oil until golden. Return the oxtails to the pan. Add vegetables, herbs and spices and stir to combine. Add the sherry and only enough stock to cover the meat. Bring to a boil, then reduce the heat and simmer covered for 3-5 hours, until the meat is done (it should be easily falling off the bones), and the sauce has reduced. If the sauce is still too liquid, uncover and boil rapidly for a few minutes.